It’s 5pm and you’ve just finished a long day of work. Your body is tense, your mind is spinning, and your adrenals are on a post-caffeine downswing. Exercise would help but you’re starting to get hungry. But if you eat dinner now then you’ll be toast for the rest of the night. A cup of coffee would perk you up but then you might not sleep very well. So what do you do? Decision making can be difficult when you’re running on empty. Sometimes the easiest solution is to call it a day and spend the rest of the evening in recovery mode. But your body and mind will be out of sorts and you still might not sleep very well. Another option is to give yourself a little pre-workout energy boost. Fruit or yogurt are always good options, but after the kind of day you’ve just had you might need something a little stronger. Time to call in the superfood troops. 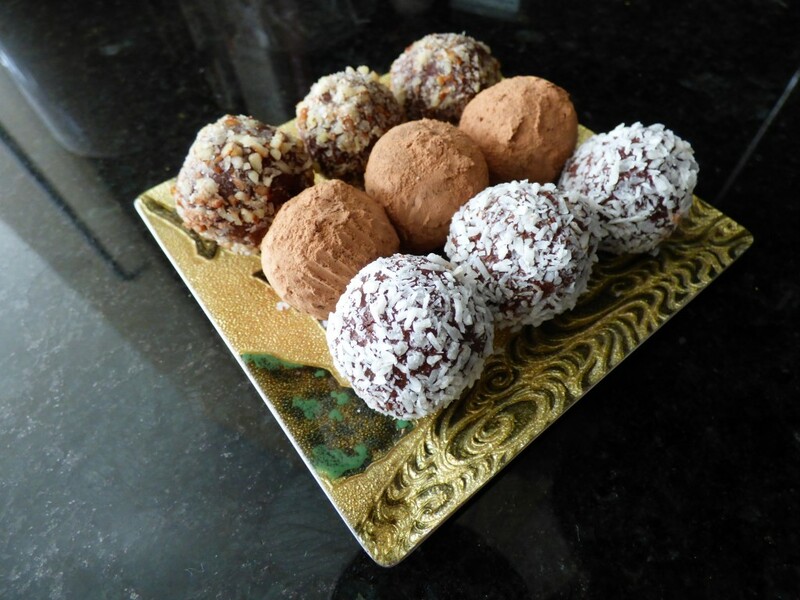 Maca Truffles are super easy to make. All you need is a food processor or high powered blender. Most health food stores carry raw cacao and maca powder (you can also order them online). This recipe is similar to my Dark Chocolate Peanut Butter Truffles with the addition of maca powder. Maca root is related to the radish and turnip, so it has a bit of an acquired taste. But the flavor blends well with nut butter and chocolate, which is why I think truffles are the ultimate maca delivery system. 1. Place powders, nut butter, 1/2 cup coconut milk, liquid sweetener, vanilla and salt into processor. Turn on high and run for one minute. 2. Scrape down the sides of the bowl and process again for one minute. Add more coconut milk if mixture is too thick to process evenly. 3. Continue processing until mixture is very smooth and then transfer to a bowl. Cover the bowl and chill in the refrigerator for at least one hour. 4. Set three small bowls on the counter. Place the chopped nuts into one bowl, the coconut shreds in the second bowl, and the extra cacao powder in the third bowl. 5. Take a teaspoonful of the truffle mixture and roll it in your hands, forming a ball the size of a large marble. Roll the truffle in one of the three coatings and place in a paper candy cup. Continue rolling truffles and alternate coatings as you go along. 6. Store in refrigerator until you’re ready to eat them. For optimal results bring truffles to room temperature before consuming.